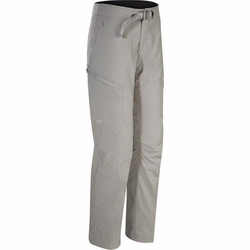 ARC'TERYX Palisade Pant. Designed to meet the range of terrain and conditions encountered on long backpacking and trekking trips, the Palisade Pant is versatile, lightweight, dries quickly, and provides comfort, protection and freedom of movement on the trail. The women's specific trim fit is streamlined and lies close to the body, minimizing excess fabric that would otherwise get in the way while negotiating technical terrain. Articulated patterning and a gusseted crotch work with the fabric's stretch to deliver the ergonomic freedom needed to handle steep grades and shifting topography. Designed to ride easily under a pack's hipbelt, the wide waistband has brushed polyester lining for comfort and moisture management. Cargo pockets are easily accessed while wearing a pack, and have volume pleats that expand their capacity while in use, but allow them to lie flat when empty. As a component of the Arc'teryx Traverse collection, the Palisade Pant aligns with Arc'teryx footwear, packs and apparel to create comprehensive systems for extended backcountry trips. Traveling by trail requires materials than can adapt and handle a variety of conditions. Durability is essential. But trail clothing needs to allow airflow, move with the body, and dry quickly should it become wet from perspiration or weather. To meet these multiple demands, Arc'teryx selected TerraTex for the Palisade Pant. Made with from a nylon plain weave with elastane fibers, this comfortable, lightweight fabric has a degree of stretch, provides sun protection, dries quickly and is air permeable.